I had surgery about a month ago and I was not given a CPM machine after my surgery. I did have that ice pack attached to the cooler which I had to keep running 24/7 just about to keep the swelling and pain in check. I did not do any physical activity until a week later when I had my first physical therapy appointment (nurse dropped the ball on scheduling the home therapy) Now I find it extremely painful to bend my knee past a 90 degree angle (in fact is normally painful getting it to a 90 degree angle) when laying on my stomach and attaching something to my knee to pull it. I can do it in a sitting position and do heel slides with minimum discomfort. When I went into the gym recently to use the bikes I had a Personal Trainer suggest I get something called "the stick" from a running supply store. I bought it and used it on my quads and knee area and for the first time since my surgery I didn't feel any pain for a while. It greatly helps with the stiffness in my muscles unfortunately it has not really helped me with my ROM as It is still extremely painful to bend my knee past 90 degree (bringing me to tears painful). My Physical therapist is very concerned that I might have to have another surgery because of my lack of Range. not swollen. I have found that 95% of the time my whole leg is swollen to nearly 2x the size of my other leg especially when I have the brace on. In fact I am at work right now and had to take my shoe off because my foot started to swell so much. Once I have the brace off and an working out on my knee (for example while at physical therapy the swelling goes down significantly how ever the extreme pain when bending my knee is still there. The pain is mostly located where the screw was inserted in my leg (I can feel the lump on the scar of the stitching and it is quite painful to the touch) as well as my MCL. 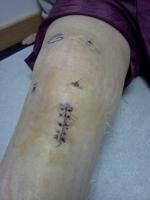 When I initially had my accident I injured my ACL, MCL and Meniscus. The doctor ended up cutting a part of my meniscus and using an donor ligament to replace my ACL but he said that my MCL will heal on its own. I have to say it hurts a lot more now then it did before my surgery. Over all this whole ordeal has been extremely painful to the point that I believe I am/ was becoming depressed. In addition to the constant pain I am in I am dealing with the failure to obtain the ROM that my physical therapist would like me to be at 130. If I had to do it all again I think I would seriously consider not going with the surgery, at least until it has become less debilitating.